The Meatball Shop is a restaurant that specializes in Italian food and various types of meatballs. They serve meatball sliders, sandwiches, or just balls on their own with tons of options for sides. The Meatball Shop has a few different locations all around New York City. I visited the location in West Village and it had a really fun cool atmosphere. The place is casual, but well themed with lots of interesting decor to look at. Despite being known for meatball sliders, I was starving and needed some carbs to fill me up. 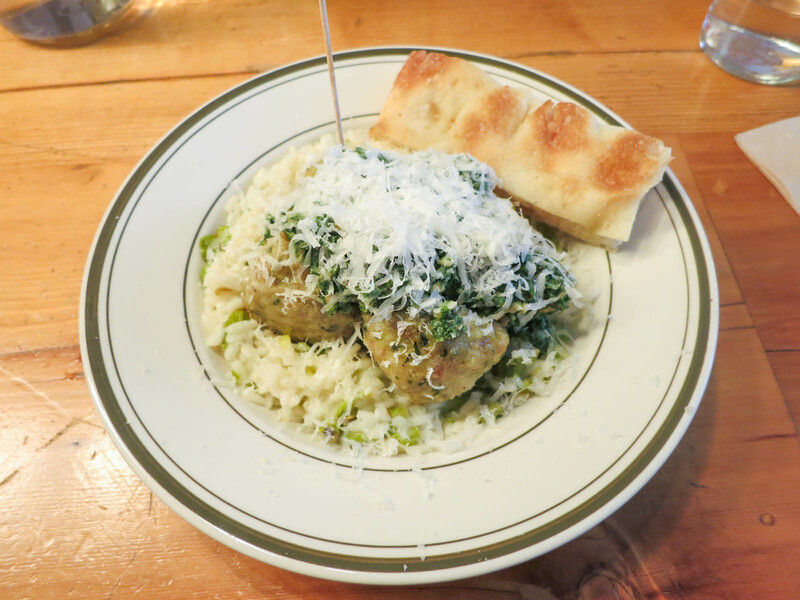 I ordered the chicken meatballs with pesto over top of their daily risotto. The chicken meatballs were juicy and flavourful and probably some of the best meatballs I’ve had. The pesto sauce was bright and flavourful and it went really well with the chicken and cheese that smothered everything. The risotto was also excellent. It had a really nice smooth, almost creamy texture and it was filled with asparagus and cheese. The Meatball Shop is a cool restaurant with tasty and reasonably priced food that I would highly recommend to anyone. The menu offers so many customizable options, so anyone could find something that they like. Yes, for a fun dining experience and great meatballs.